To shop for a new holster, belt and magazine pouches, go to our “HOLSTERS“ page. To shop for clothing, check out the HerHandgun Boutique on SpreadShirt! Many of our shirts / products can be ordered in a variety of colors. Please be cautious when modifying the colors to ensure that logos will display, i.e., it is not recommended to place a dark logo on a dark shirt. Also, If there is something you would like to order, but don’t see it, please let us know. ALL products in this online shop are printed by Spreadshirt, the platform for t-shirt printing and other apparel. 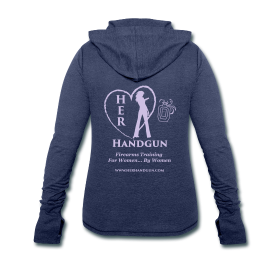 To view HerHandgun’s Boutique, click on our awesome hoodie above.